How to complete the mapping of your external portal? Follow these few simple steps to complete the mapping! 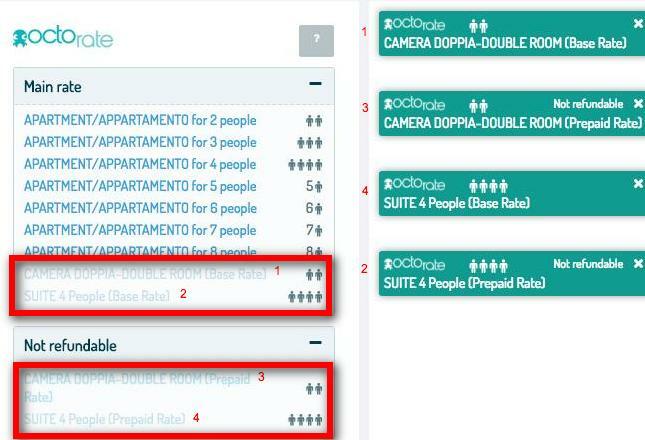 In the next window you will find two columns on the screen:the left column is the list of rooms created on Octorate, on the right you have the rooms imported from the OTA (image 3 - example). On the left column, click on each Octorate room you want to connect. They will appear at the center of the screen (image 4 - example). Follow the same procedure for the right column (image 5 - example). At the center of the screen, you will see the rooms selected from Octorate and from the OTA. Look closely at the two little squares in image 6: click on the left square pressing the mouse left button, then drag the mouse to the other square.